When it comes to finance controls and automation leadership, there’s no one more committed to your success than BlackLine and our global partners. From the moment you start with BlackLine, to engaging on implementation, to evolving your deployment, BlackLine and our partners are with you every step of the way. With over 2,600+ customers, and supporting over 222,000+ users globally, we understand complex finance and accounting needs. And with clients of every size and industry around the world, we’ve solved business challenges both big and small. Whether you want to get up and running with our full platform or add additional capabilities on to your current implementation, BlackLine Services and our partners provide the knowledge and expertise to make you successful from day one. Our implementation philosophy provides a consultative and proven approach. Our world-class support and training is available anytime, anywhere. And our Customer Success team partners with you to drive continuous and sustained innovation and improvement. Our delivery packages and ecosystem partners are focused on raising your expectations, getting you up and running efficiently and effectively, and ensuring we meet your business goals. With thousands of trained BlackLine services professionals globally, at BlackLine, and within our partner network, you’re guaranteed regional, industry, and business process expertise that’s tailored to your needs. We know that your financial close is mission critical. It’s why we’ve created a support experience that achieves the highest ratings from our customers and industry analysts. Our support is available to you 24x7x365, across geographies, languages, and time zones. With BlackLine, you get industry leading support whenever and wherever you need it. With BlackLine U, getting the most out of our solution and becoming an expert is easier than you and your team think. Our education services team is committed to empowering your organization with learning management, tutorials, and live training. It’s a powerful combination of resources to ensure you have access to training that’s personalized to your needs and always available. As a BlackLine customer, you’ll enjoy a dedicated team that is committed to maximizing your results. Our Customer Success Managers will work with you at every step of your BlackLine journey ― from going live to realizing even more value. We’re ready to develop a roadmap for your success, advocating, guiding, and helping you get the most out of BlackLine. 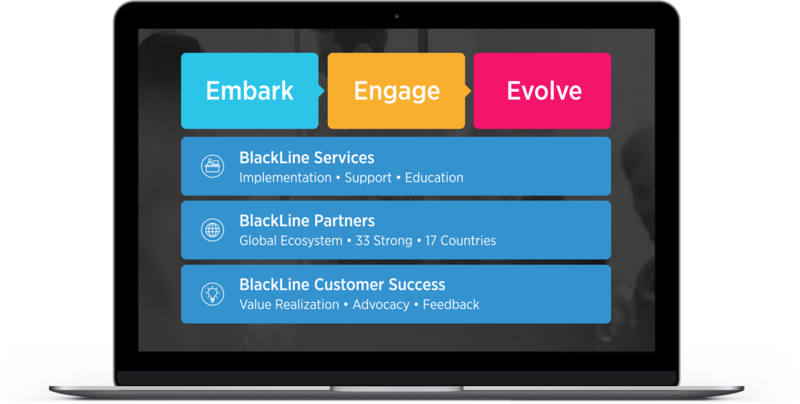 With the BlackLine Community, it’s easier than ever to leverage the expertise of our 222,000+ user network to evolve business processes, share ideas, and collaborate with peers. And because everyone is on the same version of BlackLine, we can develop and share best practices that you can benefit from on day one, and throughout your BlackLine experience. - Shay Carroll, Accounting Director GSAS, Western Union.